[Nog niet beschikbaar in het Nederlands] On Friday March 23rd, join us at NieuwLand in Amsterdam to discuss about Genetically Modified Organisms in agriculture.What is the difference between ‘old’ GMOs and new genetic engineering techniques? Will these be regulated and how? And what kind of innovation do we want in plant breeding and research if we refuse genetic tampering and corporate-controlled agriculture? Spread the word and come to share soup, ideas and knowledge! Do you already want to know a bit more beforehand? 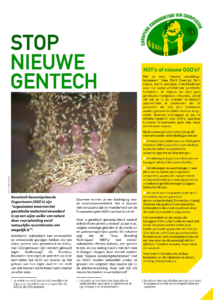 Check out here the Via Campesina brochure on New GMO’s that we recently translated to Dutch. This brochure is also available in 5 other languages on the website of the European Coordination of La Via Campesina: English, French, Spanish, Bulgarian and German. This is already the 4th info night ASEED organises at NieuwLand! In November, we discussed NGO’s presence and their impact at the COP23. After that, we invited three urban farmers from Amsterdam to map the benefits of urban farming projects in the city: Lynn Shore from the River of Herbs orchards, Ann Doherty from the CSA project Pluk! and Annemarie Verschoor from Voedseltuin Ijplein. Finally, in February, we announced the 6th edition of Reclaim the Seeds! in Rotterdam and Amsterdam, and screened a documentary about seeds. If you would like to discuss a topic or have ideas of themes for the next info nights, feel free to contact us.